Last Friday I had the very fortunate opportunity to observe the complete scoring session of the "Treehouse of Horror IX" episode for "The Simpsons". These episodes are commonly known as the Halloween Specials, and have a reputation for being the best episodes of the season. The writers have free reign, and anything can happen. The music is the same way. Composer Alf Clausen has been scoring episodes of "The Simpsons" for nearly a decade now. With usually one week to write an episode and then record it, the Halloween episodes have the unusual honor of requiring more work than normal, because there is much more music. The session started at 3pm, with the recording of the Main Titles. After Alf made sure that each of the sections of the 30+-piece orchestra could get their part perfectly, they practiced it all together ñ at that point my ears were treated to the famous Simpson’s Halloween theme, with a variation. This year, the opening sequence is not through the traditional graveyard, but instead is a unique take on the original opening sequence. Unfortunately, it’s the short version of the opening, but I don’t think anyone will be complaining. As with every Halloween Episode, there are three different segments. I will not go into details regarding what happens, since that would spoil the episode. Let me just say that all three segments feature storylines that are so off-center and are implemented in very funny ways. The guest stars are classic, and the third segment will have your sides hurting from the laughing. But enough about the writing,I’m here to talk about the music! Alf Clausen has received multiple Emmy nominations for his work on "The Simpsons". He has even won two of them for his work. But he has received four nominations for his scoring work on the Halloween Episodes, and there is no wondering why. Alf has become an expert on the Simpsons. He knows what music is needed to pull the audience a certain way, to make them laugh, feel sentimental, or in the case of the Halloween Episode ñ have so much fun you feel giddy from watching it. 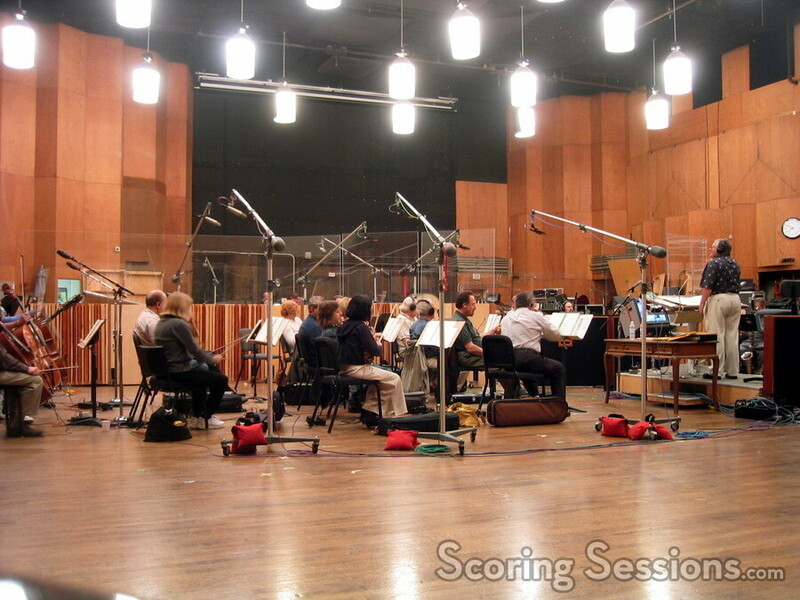 As with any scoring session, not everything will run smoothly. There were some times where after the cue was rehearsed, the recording would not go as planned. This happened enough times, that there was a fear of running past the 10:30pm deadline. But in the end, the orchestra began thinning out (the session was planned so that unnecessary instruments could leave after a certain cue, because they wouldn’t be needed afterwards) and all that was left was to record the end titles, a synthesized harpsichord and a theramin. After a few takes it was perfect, and they recorded the Gracie Logo. The evening was a success, and I had the opportunity to ask Alf a few questions. This time you matched your previous record of 52 cues. How many cues are in a normal episode? An average of 30 to 35 cues. How many days did you actually have to write the music? In this case, I had 6 days to write it. From 9am to 11pm, six days in a row. Is it a nice feeling to have your work "pay off" when the scoring session sounds great? Oh, it’s wonderful! That’s why we do all this! To get into a room full of 35 players and have them perform the work and bring it to life in front of your eyes; the instant gratification factor of this is great. Were you pleased with the way this year’s session went? Why do you suppose the Halloween Episode is considered the "big" episode for the season? I think the fun thing about it is because of the fact that it’s Halloween and it’s fantasy that there are no holds barred. The writers can go just about anyplace with the stories, and it even happens in music scoring. A lot of the things I couldn’t do in the normal course of the week-to-week episodes I can now really delve into and get adventurous with. Like the big 1950’s theme you have for Kang and Kodos? Yes, that was a theme I wrote for the very first episode of the Simpson’s I did! I started out on the "Treehouse of Horror I". So did you have to tone yourself down after that first episode? No, it’s just different because the scoring requirements of the week-to-week episodes are different than the Halloween episodes. That is because of the fact they aren’t grounded in fantasy, even though the Simpsons are a fantasy family. But we try to make it apply to real life and offend everybody as soon as we can. Do the Halloween Episodes try to top themselves each year? Absolutely! I think that this is one of the best episodes ever! The Halloween Episode of "The Simpsons" is scheduled to air on October 25th. A second CD of music and songs from "The Simpsons" has been postponed, but is expected to be released in the beginning of 1999. Special thanks to Alf Clausen, Antonia Coffman, and Carol Farhat for their assistance in making this article a possibility.